Is 1.9% GDP growth a good sign or a bad one? With the news of Aptera's next round of funding (see here and here), it seems as though my chances of getting my all-electric Typ1 have improved a bit. The lease on my current vehicle expires in early January 2009, and I am hoping to not have to extend it. This also means that I will need to sign-up for and complete a course in motorcycle safety so that I get the required license certification. And for some reason I had been under the mistaken belief that the range of the electric model was only 40 miles between charges, but recent statements from Aptera have been quoting 120 miles as the official figure. That was a nice surprise. In the most recent email that I received from Aptera about how the Typ1 wold be delivered, I was told only that new owners would be invited down to the Santa Monica headquarters for and introduction and brief training course before they hand over the keys. Now I just have to get that solar array installed here at home and I'll be all set. 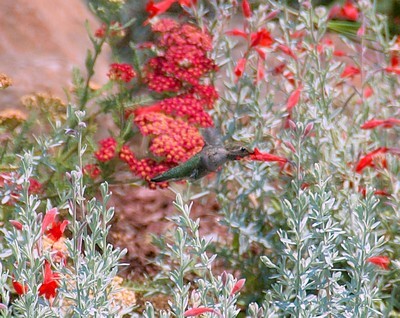 Ever since the backyard was converted from a swimming pool into a California plantscape, I have been visited regularly by hummingbirds. I have heard the almost deafening hum of their wings as they hovered just a foot above my head. Looking out the window of my home office I have observed them hopping from bloom to bloom in the late morning sun. And for years I have failed to capture a photo of one in flight. They are skittish, to put it mildly. They normally zip away as soon as I emerge onto the deck. I was reminded of what I consider the best explanation of Einstein's special theory of relativity, and in particular the adage that "when objects travel near the speed of light, time slows down". The full explanation goes from page 47-51 of The Elegant Universe by Brian Greene. What I find so remarkable about Professor Greene's explanation is the way in which it gradually sets up the punch line like a long and elaborate joke (minus the funny ending). Each step along his explanatory pathway is simple to the point of obviousness. Yet if you follow along closely you reach one of those 'Aha!' moments at the end where suddenly the entire concept becomes clear in your mind. The crux of his explanation is that all things are constantly traveling in one of four dimensions - three of which are spatial and one is the time dimension. So an object that appears to be at rest in the three spatial dimensions is actually moving forward at the speed of light, but only in the time dimension. With this idea as the foundation, the remainder is easy to explain: When an object is traveling through one of the three spatial dimensions, it has to 'borrow' some of that speed from the time dimension. If you add up the total speed of an object through the 3 spatial and 1 time dimensions, that number always adds up to the speed of light. When you apply this reasoning to a particle such as a photon of visible light - which travels through space at the speed of light - you can think of it as using up all of its speed to travel the three spatial dimensions. This leaves no remaining speed for it to spend in the time dimensions. Because of this, photons never grow old. They simply have no speed left to spare for the time dimension, so they do not experience passage of time. If photons wore wrist watches, the hands would never move. To be honest, I'm not sure why I feel the need to constantly refresh my understanding of this concept. In fact I feel a mild sense of panic anytime I find myself unable to recall the explanation. It is of absolutely no practical value to me. I am sure that most real physicists would laugh at such a simple explanation and all of the details that it omits. Some part of me is waiting for the day when one of my four nieces/nephews asks the question "Uncle Jason, why is it that nothing can travel faster than the speed of light?" I'll then run to my bookshelf, re-read pages 47-51 again to refresh my memory, then walk them through it. When the light bulb of understanding appears, and a grin comes across their face, I'll remember why it was worth the effort.